Jerry Garcia played many guitars during his career, ranging from Fender Stratocasters and Gibson SGs to custom-made instruments. During his thirty plus years of playing music, Garcia used about twenty-five guitars with some frequency. He was infamous for giving many away once he was ready to move on. These six were the most memorable and important throughout his career. Luthier Doug Irwin built three of his five custom guitars. When asked about that fact, Jerry replied, "There’s something about the way they feel with my touch—they’re married to each other…I’d never felt anything before or since that my hand likes better." Purchased from a Phoenix pawnshop for $250 in late 1970, Graham Nash gave this Fender Strat as a gift to Jerry for playing on a number of his songs. It was composed of a 1957 swamp-ash body and a 1963 maple neck. Over the years, the guitar was repeatedly customized and updated. Along with these structural modifications, this Strat was easily identified by its prominent stickers–namely the alligator holding a knife and fork, dancing across the pick guard. Frank Fuller and Rick Turner of Alembic modified Alligator frequently. They referred to it as a "Frankenstein" that was constantly changing and evolving. These alterations took place in March of 1971, January, March, July, and December of 1972, and lastly in August of 1973—though the guitar was never played onstage in its final iteration. At the end of 1972, Jerry stumbled onto the first guitar Doug Irwin made for Alembic, and bought it on the spot for $850. At the same time he asked Irwin to customize another for him. This was the inception of Wolf. It was made from purpleheart and curly maple with an ebony fingerboard and twenty-four frets. The first version bore a peacock inlay, and later received Irwin’s eagle logo in its place. A bloodthirsty cartoon wolf sticker Jerry placed below the tailpiece served to name the guitar and was later inlaid in the body by Irwin. Wolf briefly came out of retirement in 1989 as a guinea pig for Jerry’s new MIDI synthesizer experiments. It was last played with the Grateful Dead at the Oakland Coliseum Arena in Oakland, CA on 2/23/93. Wolf was auctioned off to benefit the Southern Poverty Law Center (SPLC) in 2017 for over $1.6 million, and the bid was matched by an anonymous donor, raising a total of $3.2 million for the SPLC. The guitar took a couple tumbles during the Grateful Dead's European tour—one that resulted in a minor crack in the headstock. When Jerry brought the guitar for repairs, Irwin then swapped out the peacock for his own eagle logo and added the wolf inlay. Other modifications occurred in September of 1977 and mid-1978. When Jerry asked Doug Irwin, immediately after receiving Wolf, to make another guitar, he told him, “don’t hold back.” He was told to make it the way he thought was best, and not worry about cost. Irwin obliged, and six years later Tiger hit the stage and became his most-played guitar. Named after the tiger inlay just below the tailpiece, the body features several layers of wood laminated together face-to-face in a configuration referred to as a "hippie sandwich." The combination of heavy woods (cocobolo, vermilion, maple), plus solid brass binding and hardware resulted in a 13.5 lb. instrument. After winning it in a settlement with the Grateful Dead, Doug Irwin auctioned off Tiger for $850,000 in 2002 to Jim Irsay—owner and CEO of the Indianapolis Colts. Throughout the years, not many large-scale modifications were made to Tiger. From the beginning, it was a technically complicated instrument due to the electronics that Jerry was interested in, including a five-way pickup selector and master volume control, two separate tone orbit-controls, and three mini toggles—one of which turned on and off his onboard effects loop. Rosebud was Irwin’s masterpiece, delivered in late 1989 with MIDI controls built in. Everything he learned about guitars went into Rosebud. It was named for the inlaid dancing skeleton on the cover plate that Irwin referred to as “The Saint,” but Jerry nicknamed “Rosebud”—possibly as a nod to Orson Welles’ Citizen Kane. It is almost the twin of Tiger, but two pounds lighter at 11.5 lbs. due to the hollowed-out flame-maple core. Rosebud immediately became Jerry’s main guitar for all but Jerry Garcia Band shows, where he still played Tiger for another year. In 1995, while Lightning Bolt was being modified, Rosebud was brought out of retirement for the Summer Tour. Because he felt like their magnetic field didn’t last long and the high end would go quickly, Jerry would change out his pickups every one or two years on all of his guitars. Save for that, Rosebud was not modified through the years. After spending years building custom interiors for Caribbean yachts, Stephen Cripe decided to try his hand at crafting guitars. He studied the "Dead Ahead" video until he wore it out, and replicated Irwin’s Tiger—with some flourishes of his own. In 1993 he sent the completed guitar off to the Grateful Dead offices. Jerry quickly pronounced the piece "the guitar I've always been waiting for" and began playing it exclusively. Built totally by feel, the instrument honored Jerry’s interest in preserving the rainforests, using recycled rosewood originally harvested in Brazil for the fingerboard. Cripe constructed the neck with an unusual accuracy in the higher end, which allowed Jerry to play where he usually avoided. For the body, Cripe reused East Indian rosewood taken from a bed once used by opium smokers in Asia—acknowledging the irony, but insisting it was about the quality of wood. It came to be called Lightning Bolt due to the inlay that Cripe designed. Cripe was admittedly not much of an electronics guy. So, almost immediately, Jerry gave Lightning Bolt to San Francisco repairman Gary Brawer to have the electronics re-done the way he preferred—namely making it MIDI-compatible. Cripe hadn’t known that the oval-shaped body inlays on Tiger and Rosebud concealed their batteries, so Brawer had to remove his inlay and put it on a cover-plate. A new bridge was installed during the final Grateful Dead tour. Jerry briefly met Stephen Cripe backstage at a 1994 Florida concert, where he commissioned him to build a backup copy of Lightning Bolt. Cripe was flattered, but unprepared since he hadn't measured or photographed the original. He said a member of the staff suggested he simply wing it. Jerry told him, "Just do it. If I don't like it, I'll send it back." The guitar he eventually built came to be known as Top Hat. It consisted of a walnut core with laminated cocobolo top and back, maple and rosewood neck, laminated headstock, fret board with recycled ivory inlays, and black Schaller hardware. The namesake inlay was made of warthog tusk. When he sent Top Hat, Cripe told Jerry’s staff to pay him whatever they thought it was worth—he received a check for $6,500, which made it the first guitar that he ever sold. 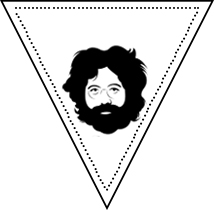 Although Jerry almost never played it, he was extremely happy with the final product.